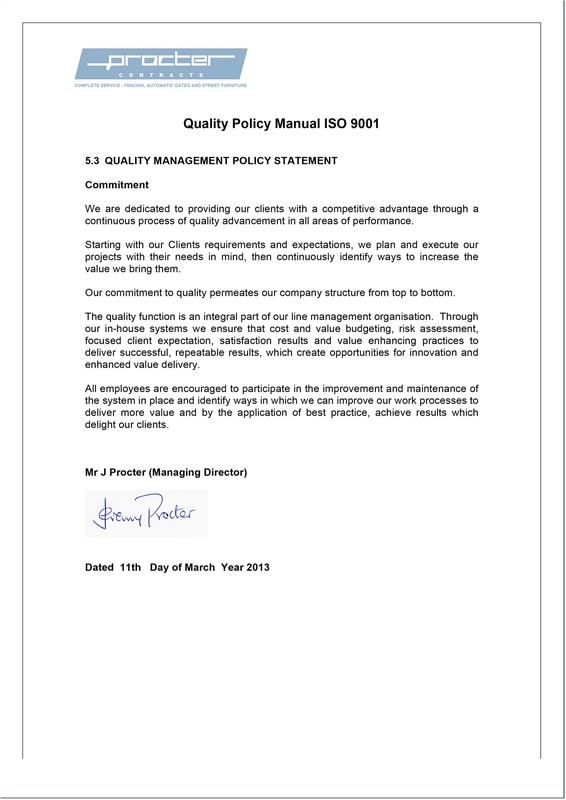 The Quality Policy of this Company is formalised and documented in the Quality Management System. It is our policy to manufacture, supply and install products that fully meet the specifications, including delivery and installation dates that have been agreed between the customer and our Company. This is to ensure that the customer is satisfied in all respects and to ensure that internal operational procedures are suitable for this purpose. This statement applies to our scope of work which is “Security, General and Ornamental Fencing, Gates, Railings and Associated items” (to the specified British Standard, the Client’s specifications and that of the National Highways Sector Schemes which apply to our Company). We review our systems; processes and workmanship to ensure that we comply with customer requirements, that continual improvement measures are implemented, that competence is maintained, planning takes place and necessary actions taken. It is our strategic objective to direct and organise our departments and personnel to provide an efficient quality management system that our clients can depend upon, have confidence in and therefore expect from us. Also that products and services are supplied to a consistent quality and are manufactured to the required specification. We have documented processes for the purpose of identifying, reporting and addressing deviations from the agreed quality procedures. We aim to work safely, within legislative and contractual parameters to meet our customer needs, expectations and hence provide customer satisfaction. Also to ensure that where applicable the product meets the regulatory and statutory requirements stipulated. Specific objectives for each year are included within our Quality Management System. 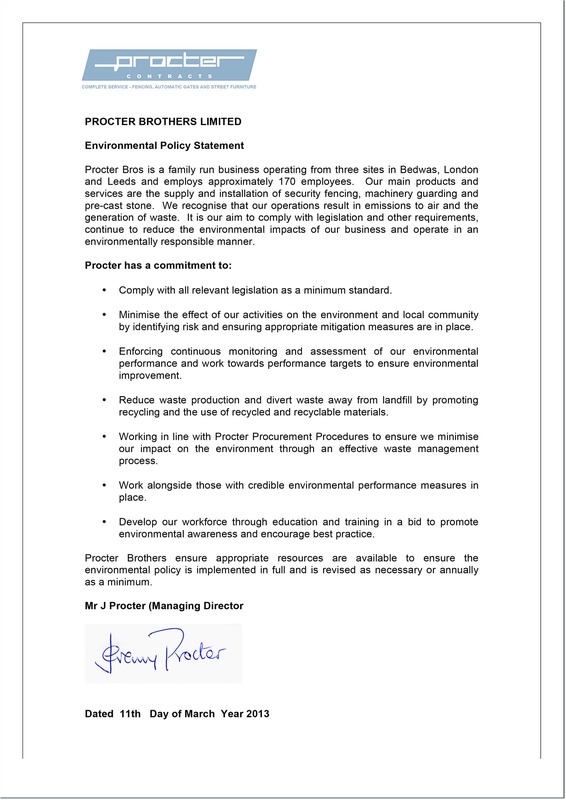 The Management of Procter Brothers Limited – FENCING SYSTEMS DIVISION will ensure that this policy and the related objectives are understood by our employees. Also, that adequate resources and infrastructure are provided, together with the administration of a structured and disciplined approach to implement and maintain the policy and to achieve the stated quality aims, objectives and competency. If at any time the above is found not to be working as intended, we have as part of the system, procedures to rectify the situation, both to meet our own needs, and those of our Clients. Objective’s, having been established, are regularly reviewed to determine progress together with actions required should there be a deviation to or from them. To assist us in achieving our aims and quality standards set, we require and expect from our client’s and suppliers “Total commitment” and assistance when required. All employees are encouraged to participate in the improvement to, and the maintenance of the system in place and to assist with the achievement of the objectives. They are given training, instruction and guidance to ensure that they fully understand their roles within it, the directive’s set by it and the competence expected. 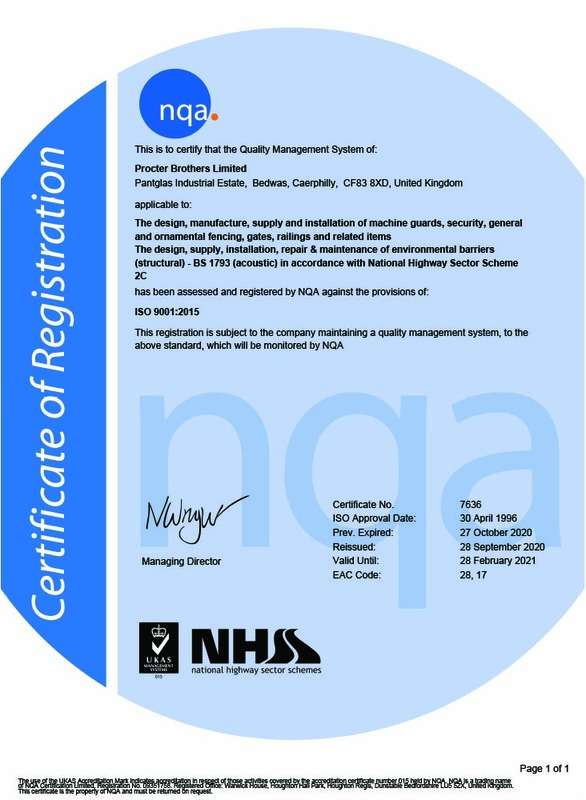 The quality systems are provided to meet the requirements of BS EN ISO 9001:2008 and may be modified to suit other National/International Standards, Codes of Practice, including our Association’s and also the Clients specifications. They will in no way, however, negate the minimum requirements. We will review the Quality Policy and the Quality Management System to ensure continuing suitability. The Fencing Director is the Quality Representative for the Fencing Division. He has the authority and the responsibility to establish and maintain the Quality Management Programme. He has the freedom to recognise any quality problems relating to product, process and systems and to initiate, recommend or provide solutions to these problems. In his absence, the Contracts Manager will be appointed to deputise. The Quality System laid down in this manual has my full support and all staff are aware of its existence and must adhere to its directive.